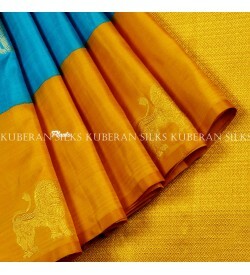 Grab the latest collection from the Kuberan Silks. This designer piece is a handloom woven kanchipuram silk saree.The blue & yellow with pure silver & golden zari gives a rich a pallu that must have in your wardrobe. This saree comes with a beautiful yellow blouse. This saree is a SILK MARK authenticated. Blue Day Mela @ EGL in Bangalore Date??? ?17th Oct 2017 Call us 9703949871 for stall booking Event Link??? ?http://www.bookmystall.in/stalls/2290/Blue-Day-Mela..